Natural Calming for Cats: Why Adopt a Cat? Whether you already have pets or you are ready to get your first one, you are now faced with the challenge of deciding what animal to adopt next. At Music for Cats, we are particularly passionate about our feline companions and the joy they add to our lives. 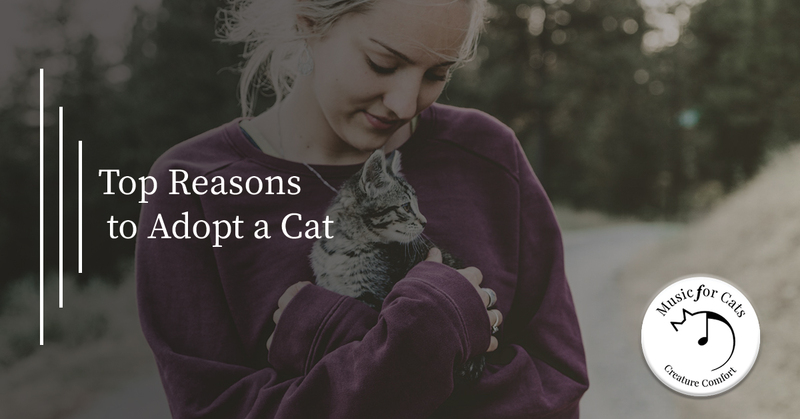 Read on to see the top reasons why we encourage you to adopt a new kitty! If you are someone who is constantly on the go, or you enjoy an active social life, a cat is a perfect companion for you. Unlike dogs, they don’t need to be let out of the house to do their business, nor do they need to go on walks. Their independence is perfect for those who live in the city, an apartment, or those who just don’t have time to spend constantly monitoring their pet. While some people believe that a cat’s independence means that they aren’t loving, any cat owner can tell you that’s entirely false. Cats can take care of themselves, but they love a good snuggle session. Most cats, regardless of how much weight they put on, will fit nicely in your lap and keep you company when it gets colder outside. Also, the softness of a cat’s fur is hard to come by. If you prefer to spend your evenings curled up on the couch, the cat will never judge you. They spend about 12 to 16 hours sleeping each day, so they won’t judge you for sitting still for awhile. You do have the option to bathe your cat, but that can be quite a struggle. The good news is, cats groom themselves! That’s one less chore you need to worry about. However, we do recommend brushing them regularly. The baths they give themselves can result in a hairball when they are shedding too much. Cats have a natural instinct that guides them to eliminate their waste in a sandy area. Once you set up the litter box and they know where it is, they know that is the bathroom. Adopting a cat means never having to put them on a leash and bring them outside just so they can urinate. They take care of that in their own time! Regardless of where you live, chances are some sort of pest will get into your home. Whether it’s a spider, a lizard, or a beetle, your cat will take pleasure out of hunting it down for you. The only downside to this is, your feet may be seen as prey when you least suspect it! While it’s always fun to play with your cat, you can bet that they will find a way to keep themselves busy. They love playing with their toys, but they can also easily spend hours looking outside the window at birds, insects, leaves, and anything else that moves. If you really want to entertain your cat, hang up a bird feeder right outside the window. Your cat won’t even know you’ve been gone all day! Cats all over the country come into the animal shelters every day. In fact, 6 to 8 million cats and dogs are admitted in one year in the United States alone; of those, about 3 to 4 million are eventually euthanized. If you choose to adopt a cat, you are most certainly saving a life! Also, adopting a cat means there is more room in the shelter to take in new cats when they need help. Adoption fees also help animal shelters stay in business and continue caring for animals that need it. Having a pet has been shown to help lower blood pressure and reduce your risk of heart disease. Also, petting a cat for a few minutes has actually been proven to release endorphins. These are the chemicals that make you feel happy! Many people choose to adopt a pet to help them feel more mindful when at home, meaning that lots of pets are considered to be therapy pets. Your cat may be able to do that for you as well. Your new feline friend will love you forever and will never leave you feeling bored. Once you get your cat, contact Music for Cats and order our album! Our music was designed specifically for cats, so try it out now.